At Green Meadow Independent School our purpose is to enable children to fulfil their potential. We will encourage them in independent thought, curiosity and a love of learning, which help them grow in self worth and confidence within a caring, safe and supportive environment. We believe that all children should experience the same opportunities and that they have an entitlement to a broad education that equips them with skills for life. We believe that praise is important and that every child should feel valued. We aim to impart the shared values of respect for others and our environment, personal responsibility, tolerance and understanding of right and wrong, so that our pupils may become valued members of the community in which they live. At every age, there is more to life than reading, writing and arithmetic but without those basic skills, it becomes difficult for children to deploy fully their natural aptitude for learning. We set out to equip children with the skills needed for successful learning so that they can gain maximum benefit from our broad and varied curriculum. In this way, we can move forward to teach children how to learn, how to find things out and how to turn interests into knowledge. It is now widely recognised that some children have a specific learning difficulty such as dyslexia, which can cast a shadow over their academic potential; it is equally clear that many extremely bright pupils may fail to achieve their full potential if such a difficulty is not recognised and dealt with. Green Meadow School will have particular expertise in this area, with teaching staff that are well qualified to identify key aspects and help children deal with them. Pupils will benefit from the individual attention; therefore those who have any problems in keeping pace with their peers can be quickly spotted and provided with structured help by highly qualified teaching specialists. They will also gain enormously in confidence from activities such as drama and physical education, and from the support and friendship of their fellow students and the sympathetic staff. We feel it is of equal importance to identify boys and girls who are academic high-fliers and to tailor their school programme accordingly, in order that they continue to remain intellectually stimulated. This will avoid their ‘coasting’ through a vital phase of their education. Within Green Meadow School our classroom size will be no more than 24 children with a qualified teacher and teaching assistant. The smaller class sizes and dedicated teachers ensures that the needs of all pupils are met, from high achievers those experiencing difficulties such as children with dyslexia. Our spacious classrooms include computer areas for the children, interactive whiteboards and space to move around the room with ease. Children within our Kindergarten class will have the additional benefits of focussed teaching during the morning and afternoon concentrating on mathematics, English, linking letters and sounds, phonics, reading and writing. All children within the Kindergarten class will wear the Green Meadow uniform and adhere to Green Meadow School’s terms and conditions. Children who attend the kindergarten class will automatically progress to our Reception Class within Green Meadow School as they have a guaranteed place. This therefore will alleviate any parent’s fears over their child getting into their preferred school place. 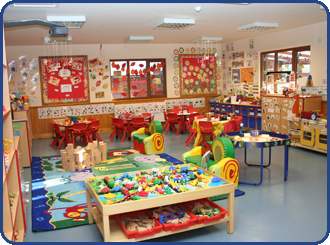 Any child who attends First Steps Nursery will have a priority place within the Kindergarten and School. We are enrolling children as young as 1 year old to ensure that children have a place within the Kindergarten/School when the time arrives. Please remember that we have only 24 places per classroom. Therefore we urge all parents to enrol their child as soon as possible to avoid disappointment. The Kindergarten Class is term time only and is for children aged 3 and 4 years old. They can access the kindergarten class the academic year before they start school. We have intakes in September, January and April. Kindergarten Packs are available at the Reception Desk area at First Steps Nursery. The cost of the Kindergarten Class is £97.50 per week (including your grant) from 8:50am – 3:45pm and includes healthy snack and lunch. Alternatively we would like to make all parents aware of the new fees for our Kindergarten Class that will include breakfast club and after school club; therefore parents will be able to utilise the full opening hours of 7:30am – 6:30pm. This new fee will be £120.00 per week (this includes your grant). Within these fees your child will receive their breakfast, healthy snack, lunch and dinner. During Kindergarten/School holidays parents will also be able to pay £120.00 per week when they require holiday club as the Kindergarten Class is term time only. This again includes breakfast, healthy snack, lunch and dinner.